Home > Mombasa Workshop > Mombasa 2018 – Beginner Day 3 – Location, location, location! Today was a big day as it was our first location shoot! We spent the morning learning about different qualities of light. When our students are out shooting on location they need to be aware that light can change at any time and must be able to recognize different kinds of light… after all, photography is painting with light. In the afternoon, we broke into groups and went to shoot on-location for the first time. It was an exciting experience for the students. Fred’s group accompanied a group of students from AKAM who volunteer weekly at the KSPCA, a donation based non-prophet dedicated to rescuing animals with the goal of placing them in healthy homes. 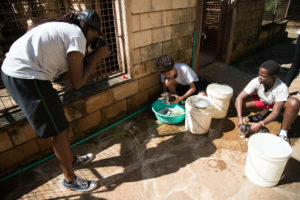 Our students photographed the AKA students washing puppies and feeding cats. Leaving at the end of the day was like pulling teeth. Sarah’s group left early for the Bedzimba School where they had a Kisauni Cultural workshop (performance) for our students! It was colorful and loud… quite the spectacle. This group loved their first location shoot and came away with fantastic bold images! Wendy’s group stayed on campus and photographed two stories; World Environment Day and the STEP Up Council. For Environment Day they got the opportunity to photograph students making bookmarks out of recycled paper for the first half of the afternoon. It was followed by team-building activities with disabled students from the local community. Simultaneously, Esha’s group shot AKA students volunteering and praciting team building through sports at the Tom Mboya Primary school. Overall our students were a little shy while photographing other people at these locations, but we’re confident that they will have more comfort when it comes to approaching people outside of the class to photograph.